This beautifully designed genuine 14K semi-solid Gold Medallion is carefully hand crafted and finished to perfection. The story behind the Miraculous Medal is remarkable and uniquely inspiring in itself. At a Convent in Paris in 1830, the Virgin Mary appeared to a nun named Sister (now Saint) Catherine Laboure and revealed a vision of this medal, front and back. The vision showed the illuminated Virgin Mary, standing on a globe, hands outstretched with dazzling rays of light streaming. Framing her figure was the inscription: O Mary, conceived without sin, pray for us who have recourse to thee. The other side was seen to be the letter "M" surmounted by a cross, the Immaculate and Sacred Hearts, and 12 stars. 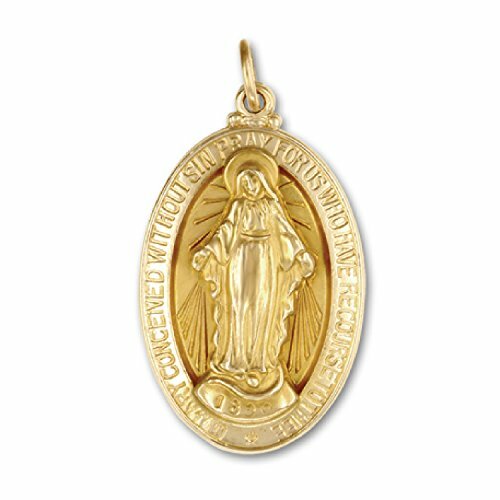 Catherine copied the image exactly, following Mary's promise that the faithful who wear this Medal will receive special graces. Every piece of jewelry you purchase from ITI Precious Findings passes the rigorous inspection of our Quality Assurance Department for Precious Metal Properties and Excellence of Craftsmanship. Medal Measurement (sizes are approximate): 5/8" x 7/8"
If you have any questions about this product by ITI Findings, contact us by completing and submitting the form below. If you are looking for a specif part number, please include it with your message.